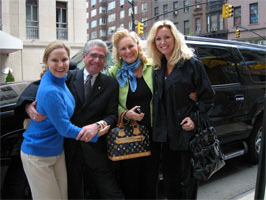 Special Occasion & Nostalgia | Custom & Private New York Tours, Inc. Honor your parents, a brother, a close friend by providing a tour that “takes them back” to the places that trace their past. Where they lived, went to school, church or where their first date with their spouse was, their first kiss, etc. It’s a wonderful and endearing experience! It’s even more fun when those arranging the tour let us know what the inside jokes are, weird habits, fun memories from the past, the time they were snowed in or lost their passport. Their reaction to their grandson’s Bar Mitzvah and forgetting the lines of a prayer or a little league home run all fodder for making priceless memories come alive. Provide us with the name places, addresses and we’ll map out your itinerary. Please provide some notes regarding certain nuances and “inside jokes” to add laughter and tears to the venue. Please, don’t forget to bring lots of tissues!